SHELL CRETE AP (PC 2108) is a single component, water based, acrylic co-polymer liquid with high solid content. When mixed with cement, it combats the shortcomings of cement and enhances the vital quality of concrete like bonding, flexural, compressive,impact strength and makes it an excellent choice for use in new as well as old renovation work. It also improves the thin section frigidity of cement by forming a full strength waterproof seal in the form of monolithic uniform membrane which also protects it fromUV rays and ageing. Can be applied in uniform thickness to horizontal and vertical surfaces and can be over-coated by exterior emulsion coating or cement based paints. It is non - flammable, non - hazardous and does not evolve toxic gases when exposed to fire. Improves tensile, flexural and compressive strength as compared to control concrete hence increases the durability of structures. Additive with cement for waterproofing of roofs, walls, water storage tanks, toilets, swimming pools, kitchen, sewers, channels, planters etc. Additive to cement mortar for repairing of spalled concrete, floor, columns, beams, canopy, slab and sealing and repair of asbestos panels, pipes and surfaces. Repair mortar for precast structural concrete members, toppings, patches, cracks etc. Clean the surface with wire brush or scrubber to remove hidden dirt, loose particles, laitance and dust. Degrease the surface by using suitable solvents. Repair the spalled concrete portion by saw, cutting the extreme edges of the repair location to a depth of at least 10 mm to avoid feather edging and to provide strong bond. Clean the concrete surface to remove any contamination where breaking is not possible. Roughen the surface by light scrabbling or grit blasting. For priming of concrete substrate, the surface should be thoroughly saturated with potable water. Remove any excess of water prior to application. 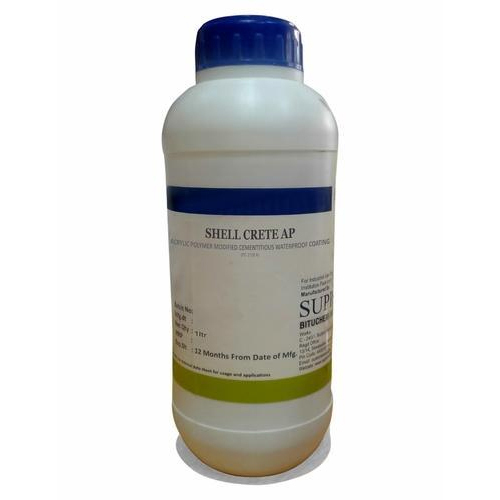 SHELL CRETE AP can be used as a waterproof coating or an additive to cement-slurry bond, repair mortar, concrete or cement based paint by mixing it in the ratio as per the given chart. Available in 1 litre, 5 litre , 20 litre and 200 litre containers. Store the material in cool and dry place. Established in 2007, we, Supreme Bituchem India Private Limited are engaged in the manufacturing of high-quality Bituminous Adhesive and Compound. Offered products range consists of Pre Fabricated Waterproofing Membranes, Waterproofing Coating, and Bituminous Adhesive, etc. All offered products are prepared using quality tested ingredients. Apart from this, offered products are well known due to their accurate composition, long shelf life and high purity. We are equipped with a spacious infrastructure. Also, our quality experts make sure to check all the offered bituminous adhesive and compound on different quality parameters to deliver our client's flawless range. For the benefit of our clients, we are offering different payment options to them like cash, DD, and online fund transfer. Apart from this, owing to our principled trade policies and client-centric approach, we have attained a wide base of satisfied clients. Also, we offer our products in the market under the Supreme Bituchem Brand name.